Thanks to anyone out there that was thinking of going to McGreevey's last night to throw tomatoes at me -- then decided against it. I might do something like that again (with a little more warning). On the past two Tuesdays, I've tried the $1 burger and Dante's $2 grilled cheese. I compared and contrasted on the way home, and there isn't a clear winner. Maybe I'll have a full post before next Tuesday. It's Cambridge Science Fest all week, and the annual Science Trivia Challenge could be an entertaining way to pick up some scientific knowledge. It would more fun to compete with a team, but the deadline has passed. There are various rounds that begin at 6pm, 7pm, and 8pm. There are other things going on during the day and evening, but this is the one that I'd want to see and looks like it will have available seats. Beverly Ford & Stephanie Schorow, "The Boston Mob Guide: Hit Men, Hoodlums & Hideouts"
The Whitey Bulger case may actually begin someday. Isn't it time to brush on Boston's organized crime history? Mary Roach, "Annual Outstanding Lifetime Achievement Award in Cultural Humanism"
The author of "Stiff", "Spook", "Bonk", and "Packing for Mars" receives the award that may not have a lot of prestige after 5 years, but Roach writes fascinating books on various non-fiction topics. You've got to love a country-metal band from Vermont, right? Well, they're not all-metal-all-the-time, but they do their fair share of rocking out. 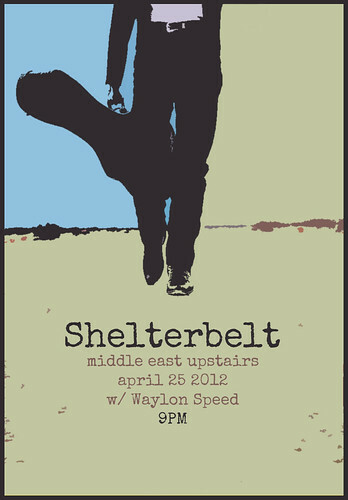 I hope to see Shelterbelt in person; the songs sound pretty good, and these guys have played in Boston faves such as Mittens, Frank Smith, Fuzzy, etc. Every now and then, I enjoy an open-mic night without performing, and I like when there's a featured performer so you know that you'll like at least one act. The good news is that the awesome Audrey Ryan is anchoring the last Test Pressing at O'Brien's before it finds a new home. Sign-ups are at 8pm, and performances should begin around 9pm. Audrey will likely go on about 10:30pm. Kristen Ford Band, Spider Cider, and Bottom of the Well went on a 7-day tour that spanned from Philadelphia to Portland. After taking a couple days off, they are joined by few friends for a big ol' folky, funky, rocky homecoming show. Yes, you'll see multiple recurring faces onstage.